Don’t forget calories, just don’t focus on them as the only important thing. James Hamblin has an article in The Atlantic, published last year, advocating that dieters should focus on eating healthy foods, and not worry about counting calories. 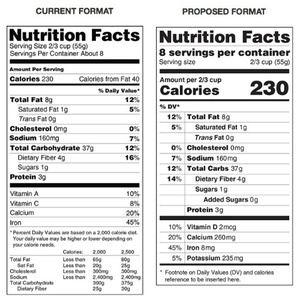 The proposed new FDA nutrition labels make the calorie number larger. That seems like a mistake. Focusing on calories puts the emphasis in the wrong place. The biochemistry is complex, but the way to think about it is not. Don’t focus on calories; focus on food choices. Eat real food, no added sugar, and you can really forget the numbers. There’s a lot of good information in this article on the relationship between simple refined carbs and blood sugar levels. It’s absolutely right that a dieter needs to be aware of these things. But I hate it when these types of article then pat people on the head and tell them not to worry about calories. I’m sorry, but if you want to control your weight, you have to mindful of them. You just do. It’s simple physics. A calorie is just a unit of energy. If you take in too much energy, your body will store the excess as fat. If you want to reduce that fat, you have to create a negative calorie balance. You can do that by lowering your caloric intake, or by increasing your caloric output through activity, or through some combination. But it’s what you have to do. Now it’s also true that, to be successful, you need to think about more than just calories. A diet composed of nothing but Cokes or small Oreo portions, even if the overall calorie intake is low, is almost certainly not going to work, for all the reasons Hamblin discusses. A meal needs to be rich in healthy fats, proteins, and complex carbohydrates if it’s going to satisfy your appetite for more than an hour or so. But I guarantee that you can gain weight on a diet of healthy food. I know. I’ve done it. Including fat and protein in your meal helps with controlling your appetite, but it doesn’t mean that you can pig out on whole grains, chicken, fish, and vegetables and escape the caloric equation. The problem of course, is that restricting calories is no fun. People don’t want to hear that they need to do it to control their weight. Eating strategically and healthily can help with willpower, make it much easier to live with the calorie restrictions, but it can’t make that basic requirement go away. So, if you’re concerned about your weight, eat healthy, but don’t ignore the calories you’re taking in. It’s still the ultimate factor in what will happen. This entry was posted in Zeitgeist and tagged Calorie, Calorie restriction, diet, dieting, Food, Human nutrition, Science. Bookmark the permalink. 27 Responses to Don’t forget calories, just don’t focus on them as the only important thing. If you tell me that you need to eat in the right portions, then I would ask, who defines what is the “right portion” for you? We’re all mortal. In the end, something is going to get us. That said, one of the things that drives me crazy with the media is they rarely, if ever, puts news of studies into overall context. A fringe study that says drinking bottled water is harmful gets the same treatment as one that confirms mountains of other studies that drinking full sugar soft drinks leads to weight gain and diabetes. In reality, the healthy food recommendations haven’t change much in decades. Eat a well rounded and diverse diet that includes lots of different protein sources, dairy, fruits, vegetables, and whole grains. Fresh is better than frozen, which is better than canned, but all of it, health-wise, leaves Oreos in the dust. On portion size, years ago I heard a recommendation to use the size of your fist for your portion sizes. It’s what I try to stick to on buffets. A fringe study that says drinking bottled water is harmful gets the same treatment as one that confirms mountains of other studies that drinking full sugar soft drinks leads to weight gain and diabetes. Ah! But if something is going to get us eventually, why do we have to pin that down to diabetes and not on bottled water? Who decides that the bottled water study was a fringe study and not to be taken seriously? Do we take it seriously until it does become serious? But when does that happen and who decides that? If you laugh at that, think about the cases where we brushed something off as harmless only to realise later that it was not. Well, all knowledge is ultimately just belief that we have justification for confidence in. When there are dozens of studies that say the same thing, it feels like much firmer justification to me than a single study here or there whose results haven’t been replicated. Yes, there’s always that first study to find something, but until its results are replicated, in most cases, I think we’re okay with not making decisions based on it, or holding it up as a counter to what most other studies are saying. On the portion size, it was just a strategic eating tip I’ve found useful, not an ontological argument. It looks like the article is more aimed at the notion that you can eat as much junk food as you want and just exercise the calories off later. I know people who think this way. It doesn’t work. However, Hamblin might be pushing a little too hard in the opposite direction. I think you’re right. I guess what bothers me about Hamblin’s piece is it encourages ignorance. If he had just said that calories aren’t the whole story, that you also need to understand sugar, fiber, fat, protein, and their effects on blood sugar, I probably would have have highlighted rather than critiqued it. Yeah, I think Hamblin is overstating his point. You can’t fix a problem by creating the opposite problem. It’s such a simple equation. Calories in + calories out = gain or loss. The problem is that so many calories taste so damn good. Even the healthy ones. Sometimes, especially the healthy ones. A few years ago, I watched a documentary that asserted that civilization owed its rise to beer. It allowed people to consume large amounts of calories quickly (a desirable thing for laborers), and provided an alternative to (often contaminated) water. I’ve heard that about beer. Also that the Pilgrims landed at Plymouth Rock instead of in better land down south (per plan) because they ran out of beer on the ship and had (had!) to make landfall so they could make more. Alas, I’m not much of a beer drinker. Or a drinker of any kind of alcohol. Not for any philosophical or ideological reasons; I just don’t care for the taste or how it makes me feel. I was much the same. I figured out that some foods held me much longer than others. It didn’t really matter that cookies tasted much better than whole wheat bread, since the bread would keep the hunger away much longer. The problem, of course, is that even eating the right foods takes discipline. When I decided I needed to diet to lose weight, I just told myself to forget about anything tasting good. I can be a bit extreme sometimes, but I really had to do that with myself. I’d spent nearly a year working out every day and nothing was happening. I finally decided to figure out what was going on. Tracking my calories made everything perfectly clear. Not to say the exercise didn’t do some good, but I certainly needed that reality check. That fits my experience too. Dieting is largely about deciding that it’s more important than anything else in your life, at least for the present. I do think exercise helps by raising how many calories you can eat while still having a negative balance. It seems a lot easier to have that negative balance when the resulting calorie intake is above your basal metabolic rate rather than below it. I have no idea what a “basal metabolic rate” is. What is it? How do you figure it out? Basal metabolic rate is a fancy term for how many calories you burn if you just spend the day lying around doing nothing. Your body doesn’t like a negative calorie balance, but it really doesn’t like a calorie intake below the BMR. You can get a very rough ballpark of it by multiplying your ideal body weight by 10. And ideal body weight is determined with something like a body mass index? I think I have mine in a doctor’s report somewhere. I might have to check that out. BMI isn’t a bad indicator, although it oversimplifies wide variances. It doesn’t work well with people with smaller than average frames, or much larger than average ones, and it’s fairly useless for bodybuilders. Hm. Surprised to find out I have a large frame. The wrist measurement chart says I should weigh 122-137…not quite sure I believe that. On the frame thing, you might try googling around, and compare the result with two or three other sources. Often the first site that comes it is the most reliable, but not always. I think that if you focus on foods with low energy density – mainly plant-based – you will tend to consume fewer calories, and perhaps this is the point of the article. “Foods” like oreos and coke will add lots of calories without filling you up, so that is almost guaranteed to make you put on weight. Beer tends to do the same, unfortunately for Wyrd’s theory. This is why the old advice to eat a low fat diet isn’t very helpful. It leaves you hungry, so you pig out on carbs, leading to high calorie consumption. Of course, there’s a distinction between eating to lose weight, and eating to promote health. These things have overlap, but aren’t the same. Agreed across the board. In particular, the point that weight loss and health aren’t necessarily the same thing is a good one. It can be, but sometimes the psychology of eating a small portion of chicken nuggets or peanut butter can make a diet a lot easier to stick with.